What does any of this have to do with finance? After all, that group includes more than just financial professionals. So the fast rise at the top isn’t just amongst hedge fund managers. Well, as the paper discovers, the reason lies in changes in executive compensation, ie the stock market. Even if you weren’t directly in finance, increasing compensation in stock options and the like meant that top “executives, managers and supervisors” started taking home much more income than they used to. Indirectly, then, financialization (of pay) contributes to redistribution of wealth upwards. 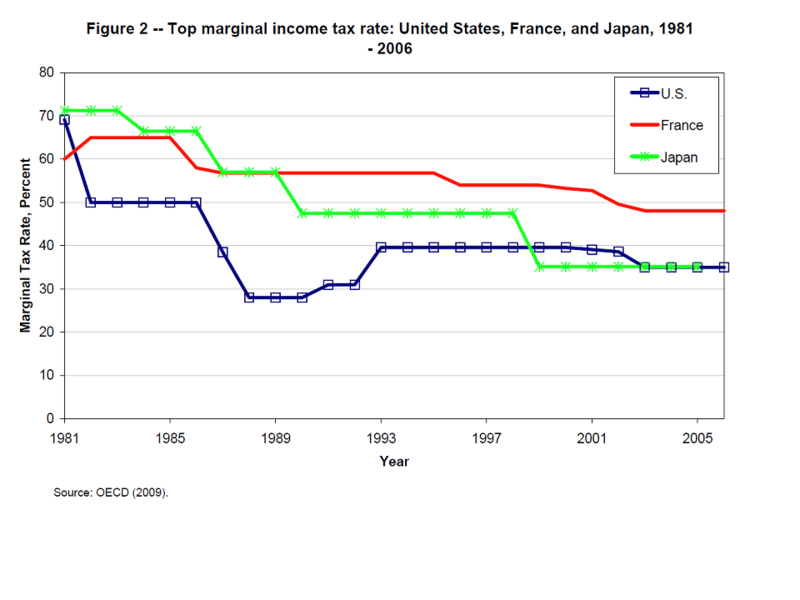 This suggests marginal tax rates don’t have such a dramatic effect on distribution at the top as one might think. The authors further suggest that, since it was illegal in Japan until 1997 to compensate executives with stock options, and remains a less common practice, it is the practices of executive compensation that explain the difference. Thus the current debate in the US over taxes is extremely important (the paper also has an important discussion of why Laffer curve arguments against higher taxes on the wealthy are not well supported), but it is a small part of the overall determinants of social stratification. Second, and following from that, these results are further evidence for the thesis we have been advancing about how regulation entails a class restructuring, not just correction of the market. Regulations, including indirect financial regulations like limiting executive compensation in stock options so that incentives are turned towards long run economic health of the company rather than short-run stock price changes, will affect not just those directly in the financial industries but those whose economic fates are directly tied to its fate. Third, the paper bears implications for the wider political economy of the last thirty-forty years. Two arguments made in defense of a well-developed financial industry are that a) financial instruments allow business persons to hedge risk and b) they make certain kinds of production possible by concentrating capital (lots of little deposits in a bank) and making it available for loan to enterprises that otherwise couldn’t get off the ground (banks making business loans). These are sensible arguments in theory, but the actual practice seems largely to have been otherwise. Financial markets have been a hugely effective tool – far more effective than changes in marginal taxes – at redistributing wealth and income upwards. Even as many people at the lower and middle lost pensions, not to mention houses and other sources of wealth and income, and experienced stagnating wages, incomes at the top rose dramatically. Those seem to have been the most significant results of the past decades. There are no doubt many Luddite criticisms of finance, but there are many ideological defenses of it too. On Tuesday I noted the decline of social mobility in the United States as a key underlying trend, which tax cuts and the Great Recession have brought to the fore. It is worth noting that Americans do not appear to have a very good sense of these basic trends. For instance, Americans are way more likely than other nationalities to believe that ‘people get rewarded for their effort’, while they are much less likely to think ‘differences in income in their country are too large,’ and that ‘coming from a wealthy family’ is necessary for getting ahead (all in same link). These beliefs are radically out-of-step with social reality. Aside from the studies from last post, there are others that show about half of a person’s income in the United States is determined by the class he/she is born into (page 5). It is not easy to interpret what any of these beliefs mean politically. Other well-conducted studies show a flagging faith in the proposition that the next generation will be better off than this one. Moreover, when asked what kind of wealth distribution is most just, most respondents pick a society that looks a lot more like Sweden than the United States. So it appears Americans have some empirical awareness that society doesn’t quite live up to the ideal of social mobility, and that their general ideas of social justice might be a basis for critical thinking about our actual political economy. But one suspects that the real problem has to do with political, not moral, philosophy. Even given the moral belief that American society is unjust, there is the political problem regarding how to use collective power. One of the ways in which Americans tend to be exceptional is in rejecting the idea that it is the responsibility of government to reduce inequality. As the graph in the previous link shows, the median position in the developed world is for 70% to think government should be used to reduce inequaliy, while just over 30% of Americans think so. The social mobility ideology reinforces this view. We can say there are three different positions on social mobility. The dominant one we can call competitive individualism. Where you end up in life is a product of your own effort. Moreover, and this is important, you are in competition with others when you seek advancement. Your success implies someone else’s failure. That is not just the dominant view subjectively, but it is how our society works. 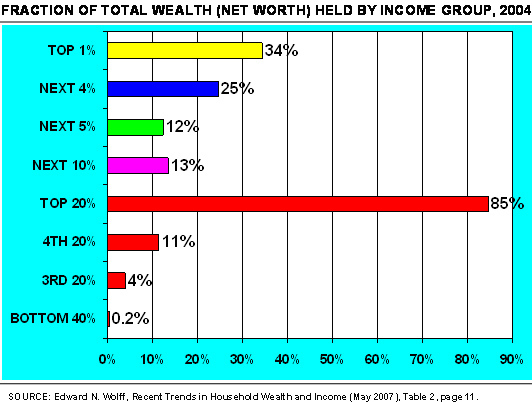 As the graph below shows, in our society there is the top 20%, who own 85% of the wealth, take in 93% of the income, and control most of the positions of social and political power. The bottom 80% get the other 15% of the wealth (mostly houses) and 7% of the income. (In later posts I will clarify why I think this this is the relevant cut off). For every one person who rises into the top 20% four have to not make it. Even if you don’t think top 20 v. bottom 80 is exactly the right way to divide things up, it is generally clear that this society runs on what Tuesday’s post called – quoting Jefferson – a ‘natural aristocracy.’ The idea is that the most successful make it, while the rest are subordinate to the meritocratic elite. On this view, the ideal of social mobility is not to enter the ruling class, but for each person to attain a condition of independence – economic self-sufficiency and control over one’s daily activity. This is the kind of independence appropriate to a democratic society in which everyone is equal. I think the second view is already an advance on the first view because it at least begins to think about the problem from Tuesday’s post – how to think about social mobility in a way that doesn’t assume inequality. However, it still assumes that our fates are separate, not determined by a shared, deeply intertwined structure of economic opportunities – opportunities determined by the distribution of property, education, tax law, and the overall structure of the market. It is only with a third view that we start dealing with the political problem – the problem of suspicion of collective power, and of the belief that the only way to advance is alone. The third view we can call the solidaristic view. On this view, we rise together. The other person’s improvement is a condition for my own, and we can only rise by cooperating, together. Other persons are neither an obstacle nor a matter of indifference. Rather others are a source of my own freedom and independence. Creating this kind of solidarity and shared sense of fate is a key political task. It requires overcoming prejudices and beliefs that naturally develop in an economy like ours, especially when mainstream politicians reinforce these basic ideas all the time. But it is far more important than just winning general arguments about the most moral or most just arrangement of society. When Obama was elected he declared it a victory for the American Dream. Even a black man can become President. Surely that was evidence of the possibility of social mobility in theUnited States. Yet even a casual reader of any newspaper knows that the facts point in the opposite direction. Here is one graph illustrating the decline over the past thirty years. 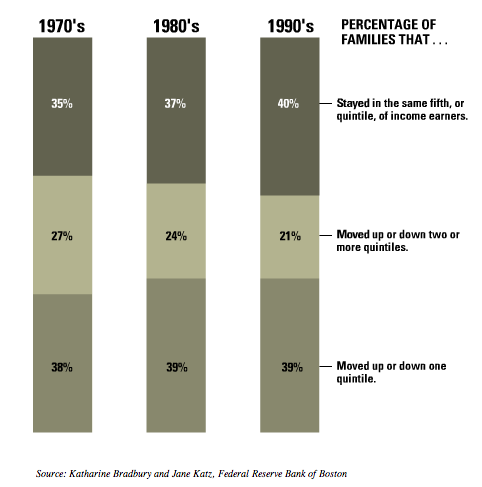 Indeed, as this chart from Business Insider shows, not social mobility but social stagnation appears to be the norm. Real wage gains are worse even than during the decade of the Great Depression, and real average earnings are barely above what they were fifty years ago. 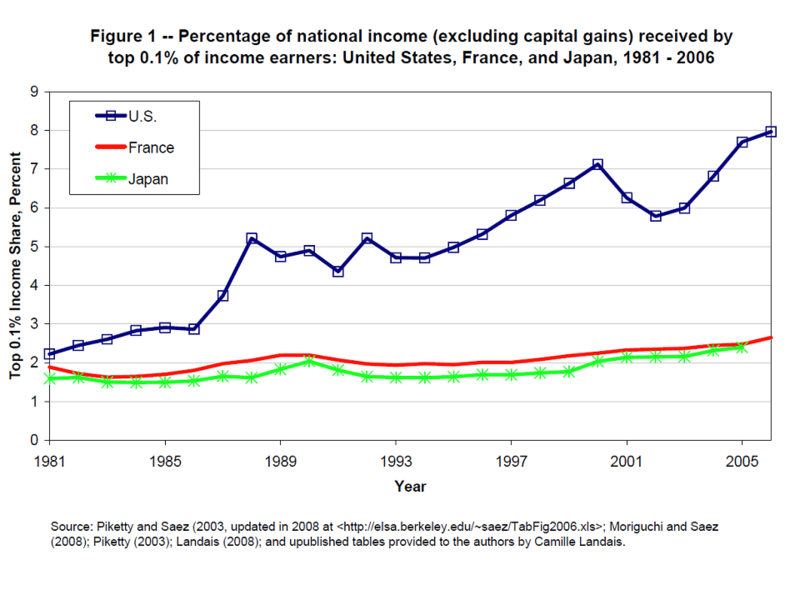 Social mobility is the myth, call it ideology, that has defended America’s enormous income and wealth inequality. A popular feeling seems to be that inequalities are acceptable so long as everyone has an equal opportunity to make it to the top. But the opposite is in fact true. The more unequal the society, the less opportunity there is to go around. Put the other way around, the myth of social mobility turns out to be an excellent tool for sanctioning enormous inequalities – inequalities far greater than exist in societies based on other social philosophies. This was a good argument for battering the walls of the ancien regime, for destroying the intellectual foundations of hereditary monarchy and aristocracy. But as Jefferson himself admitted, it replaces one aristocracy with another. This hardly seems the appropriate social philosophy for a democratic society. Yet the myth of social mobility is our version of the natural aristocracy – those who rise, do so because of natural talent, and thus deserve their entry into powerful, high earning professions. Perhaps the decline of social mobility is an opportunity to rethink the aspirations of a professed democratic society in the first place.